I have had the opportunity to watch and listen to several birds.Some do not visit to say hello but to eat a squash flower or a seedling or a beneficial buddy of mine. This bird on the chair is too funny. Oh how I love my birds. I , like Laurie, have turkeys too, but we have kingfishers who hunt the swamp and love to sit in my garden. I also have Pheboe's and all kinds of nuthatch, wrens, and add swamp birds such a herons and cranes. 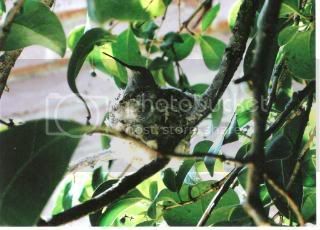 A little birdy told me hubbs was getting me a new cannon SLR digital for Christmas stay tuned for bird pic!!!! That dancing Cockatoo is pretty cool. What's not so cool is how loud they can scream. They have a honk that's a cross between a car alarm and a Canadian Goose. One day on the train I met a fellow from Australia, and told him I have a Cockatoo. His instant reply was "Bloody loud and obnoxious things, aren't they?" chickadees will not come to my house ! I have 2 friends that get visits from them I go there to see them and take thier pics! Juncos, Titmouses, None here by me I wish! Cardinals, I love to photgraph them but do not need them in my gardens! Woodpeckers are so beautiful as long as he doesnt peck at my Privet,they have been behaving. Morning doves, I only saw them in Spring this past year.I use to see Robins,they sorta hung out with me every tilling day for a few months in 05. I fed them all the grubs that were under my ground as Itilled it. That I have this black bird, not sure if he is a grackle or black crow.I do know he is meannnnnnnnnnnnnnnnnn worst then the Blue Jays! He was trying to kill baby squirrels. Sure I don't want those thieves but I was on there side this time! They only went after the tiny scared babies. 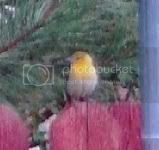 Many purple and yellow finch ! I have never seen a purple one! WOW! Crabber you have turkeys too *LOL!!!!!!!!!! Kingfishers are pretty colorful birds that eat fish correct? Hopefully I wont get them at my house! Bob, Yes too loud for me,My cockatiel, Timothy screams, the only way to SHUT him UP is to whistle a soft tone to him, then he will whistle along. Not sure of the black bird's name. Chickadee is at a friends house. A friend took this photo outside his condo in AZ. 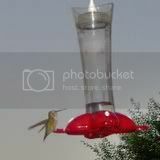 He gave me the photos as he knows I am a nut for hummingbirds. I had never seen one sitting on its nest. Tried tempting the orioles away from the feeders with grape jelly which they LOVED! 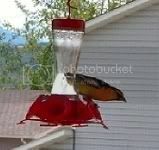 But they ate all the jelly and came back to the feeders to wash it down with a drink! LOL! They have a lovely song, but tend to chide you for being in their sight more than they sing. The 3rd brood of swallows for 2008 - the pair comes back every year (since 2001), and make their nest in the corner of our front porch, so we just leave their nest up now. They generally hatch 2 broods - 2008 was 3 broods and 2007 was also 3 broods! Really unusual as the juviniles from earlier broods will help feed the later brood! These birds were mostly gray shades of color but had underwings of white, with a dark band around the neck. The doves also liked sitting on top of our chimney as it is the tallest point around - was eerie hearing those cooo-cooos come down the chimney. Us being in the yard doesn't even faze them. And hummingbirds again - we have several who visit and watching them stake out a feeder and police it is always entertaining! Poor little things must have flown through the snow to get here by tonight! Good thing we leave the nest up!! Chickadeez came to nest at my house! Excellent shots ! Thanks for sharing! To my great wonder ans surprize I was working outside *lol and saw birds flying in my bird houses,never thought in a million years they were chickadees! 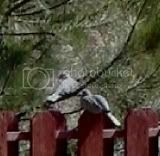 (I couldn't see across the yard at what kind of bird), just thought it was the sparrows and when I saw who they were I ran like the wind and got my good camera.The pauses are from me taking pics while recording. 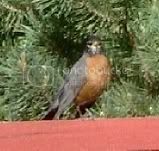 The robin is the their that stole 7 worms by the time I got a few pics of her! Earlier I had cardinals which was another thrill.I only have a few pics and they are pics when the thief stole my squash flowers caught him in the act, it took a while but I had to know who was the thief*lol. Pleased to say I now have pretty new visitors..Hope they get great use of my bird houses! It is still fun to see. A few weeks ago I saw a tiny baby woodpeckers at a friends house.I was thrilled to watched them.They were so cute and tiny. I have woodpeckers but they come here a little later more like summer time for the sunflowers.Although I hear them pecking at the trees. Dizzy what great pics! You too Kale. I have a wounderful Yellow crown night heron I took this weekend. Ok I know post them. Well I ordered 6 flash drives on line so I can copy and post pics at work. I am just waiting on their arrival should be any day now. I can't wait for you to see my pics. Aw, they're so cute! And those are great pictures. What kind of camera are you using? I love to sit in my swing and watch the bird's.The bluebirds are busy building nest.a few already have tiny blue eggs in the nest boxes.We have alot of redbirds,our owl,s,bluejays,mockingbirds,wrens,several others don't know what they are.I heard turkey's gobbling yesterday morning in the back side of pasture.I have seen a few hummingbirds. Mine is just a HP Photosmart M417 5.2 MegaPixel - I keep it set on best or better (large size pics) and then crop & resize the photos as needed. Kale and Dizzy, thanks for sharing the pics, they're great! My tripod is ready, only I will have to place the camera back on. Can't leave it there..May get another movie today. Bob's reply reminded me of some neighbors across the street. When we first moved there I would periodically hear screams coming from inside their home. I really thought this guy was beating up on his wife but since I never could SEE any proof I held off on calling the police. Good thing, too. About six weeks later (as we got to know them a little) we found out they had a couple of large macaws and that's what was making all the racket! Kale, your movie was just fine! The shots of the bird were great!